The municipality of Granada (234,758 inhabitants in 2016; 8,802 ha; municipal website) is the capital of the Province of Granada. The municipality is made of the town of Granada and of the villages of Alquería del Fargue (516 inh. ), Bobadilla (351 inh. ), Cerrillo de Maracena (1,935 inh. ), and Lancha del Genil (1,192 inh.). The town itself is divided in the following districts: Ronda (51,740 inh. ), Zaidin (47,731 inh. ), Norte (41,820 inh. ), Genil (35,028 inh. ), Centro (32,916 inh. ), Chana (27,533 inh. ), Beiro (26,890 inh. ), and Albaicin (16,281 inh.). There is "no other town in the western world" that has been the subject of both serious historical studies and legend fabrication. Granada was allegedly founded by Grana, one of Noah's daughter, or by Granata, one of Hercules' daughters. Henríquez de Jonquera (Anales de Granada, 17th century) claims that Tubal, Noah's grandson, settled in Spain with his family and founded Granada; he granted the town with laws, poetry, music, astronomy and a calendar; sciences, law and arts were invented there 800 years early than in Greece. Yet another tradition reports that Granada was established by the first Jewish diaspora. The oldest settlement of sure origin in Granada is credited to the Turduli, the most significant Iberian tribe in Andalusia; in the 5th century BC, the town minted its own coins, which indicates its power. After the Roman conquest, the town was renamed, as evidenced by coins, as Iliberi / Iliberis; in the 1st-2nd centuries, inscriptions and coins name the town, then a municipality of Roman status, Florentia / Municipium Florentium Iliberianum. Remains of street pavement, pottery, capitals, columns and statues, as well as remains of a paleo-christian basilica are shown in the Provincial Archeological Museum. The Christian religion was allegedly introduced to Granada by St. Caecilius, one of the Seven Apostolic Men and the first bishop of Granada. The bishop was martyred during Domitian's second persecution in Sacromonte. St. Gregory Baeticus (d. 392; biography), was a famous theologian; several books attributed to him by early scholars, however, were subsequently credited to other, often unknown authors. Granada and the neighbouring town of Elvira were seized in 712 by the Moors, after a one-year siege. The governor of Elvira, Abd al-Rahman al-Xaybani, ordered the rebuilding of the citadel and fortifications of Granada, which soon superseded Elvira as the main town in the area. Together with Córdoba and Seville, Granada formed the triad of the most important towns in Al-Andalus. Zawi-ben-Ziri established in 1013 the first Kingdom of Granada, which was nominally dependent of the declining Caliphate of Córdoba. After 150 years of permanent warfare against the Almoravid and Almohad dynasties, the Zirid kingdom was succeeded by the Nasrid kingdom, founded by Abu-Abdall‡ Mohamed Ibn al-Ahmar Ibn-Nasr (1238-1273). The Nasrid erected on the hill located across river Darro, known as Sabika, the Alhambra city, indeed a group of oriental palaces and gardens surrounded by fortifications protected by a dozen of towers. Travellers and writers have contributed hundreds of pages describing the palaces, gardens, mosques, baths, Quranic schools and hospitals of Granada. The Jewish community flourished, protected by the Zirid and Nasrid rulers; the synagogues and talmudic schools of the town, as well as its Jewish scholar, became famous in the Christian and Islamic words. The town was nicknamed Garnata al Yahud, Granada of the Jews. Rabbi Moses ben Jacob ibn Ezra (1055/1060-1138) is one of the three most important Hebraic-Spanish poets, together with Solomon ibn Gabirol (1021/1022-1050-1070), from Málaga, and Judah Halevi (c. 1075-1041), from Toledo. Granada was reconquerred on 2 January 1492, which ended nearly eight centuries of Muslim presence in Spain. The town attracted all kinds of travellers, adventurers, craftsmen, artists... so that its population increased to 500,000. Granada's fame, however, was overshadowed by Seville, whose connection with the conquest of America made the capital of Andalusia. The flag and arms of Granada, submitted on 2 February 2009 to the Directorate General of the Local Administration, are prescribed by a Resolution adopted on 10 February 2009 by the Directorate General of the Local Administration and published on 23 February 2009 in the official gazette of Andalusia, No. 36, p. 31 (text). Flag: Crimson and green, made of two equal vertical stripes; the first, at hoist, crimson red,and the second, green. In the center, bordered, the coat of arms of the town of Granada. Coat of arms: Per fess, 1. Argent the Catholic Monarchs sitting on their throne, with crown and cloak, proper, King Ferdinand V on the right holding a sword in the right hand and Queen Isabel I with a scepter in hers, surmounted by a red canopy. 2a. Or the Watch Tower masoned argent ensigned by a flag of Spain gules and or. 2b. Argent a pomegranate proper faceted gules with two leaves vert. A bordure compony of 12 pieces in turn Le—n and Castile, in chief and base the castles ensigned by two flags gules. The shield orled by a scroll or inscribed with the titles of the town: "muy noble, muy leal, nombrada, grande, celebírrima y heroica ciudad de Granada" a tassel or appended in base. The shield surmounted by a Royal crown. The flag was originally approved on 6 September 1983 by the Municipal Council. Red symbolizes the Nasrid dynasty while green is the colour of Islam. The flag of the Nasrid Kingdom of Granada was red with a golden diagonal stripe running from the flag's upper right corner to its lower left corner. When they entered Granada, the Catholic Monarchs bore their banner or Royal standard, made of a shield with the quarters of Castile and León, Aragón, and Sicily. Established short after the reconquest, the Castile Old Guard was granted a green standard, charged in the center with the arms of the Catholic Monarchs with St. John's eagle and four red pomegranates in the corners. Granada had no proper flag but a banner, or Granada Royal standard, which was indeed a banner of the arms of the Catholic Monarchs. The flag appears to exist with several variations in the precise design of the arms (photo, photo, photo, photo, photo, photo, photo, photo). The Watch Tower (Torre de la Vela) is the emblematic element of the emblematic Alhambra, being comlpared to the prow of the vessel. The tower was known as Main Tower to the Nasrid and as the Sun's Gate in the 16th century. Four-storeyed, the tower is topped by a terrace, whose crenels were destroyed by earthquakes. The bell located in the terrace, rang in the past as a warning signal, is now used in solemn circumstances. The flags of European Union, Spain, Andalusia, and Granada are usually flown on the terrace (photo, photo, photo, photo, photo). 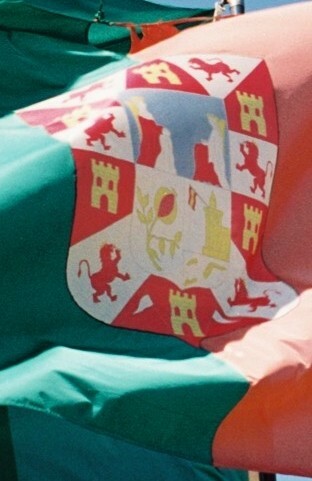 On this flag (photo), the coat of arms appears to lack the scroll and to differ from the official model by several details. In August 2008, the removal of the flag of Granada from the Watch Tower stirred local fuss. Mayor Juan García Montero (PP) claimed in a press conference that the action was "yet another evidence of the separation maintained by the Government of Andalusia between the town and the monument". The body in charge of the management of the monument answered that the staff had been broken, and soon reestablished the municipal flag. Throughout the city there could be seen lots of flagpoles flying a simple red-green flag. The coat of arms granted to Granada by the Catholic Monarchs showed in the upper part the Monarchs sitting on their thrones and in the lower part a pomegranate (granada) - representing the Christian reconquest of the town. The coat of arms in current use does not fully match the design originally granted by the Catholic Monarchs. In the chief and base components of the bordure, the origin red flags, also shown on the arms of Motril, were substituted by red and yellow flags, which, of course, did not exist at the time of the original grant; moreover, red flags are prescribed in the official Resolution. The flag hoisted on the Watch Tower should not be the national flag but the red banner of Castile. During the assault, Granada must have used the aforementioned Granada Royal standard, which was kept in the Town Hall. In 1843, Granada remained faithful to Queen Isabel II during General Espartero's Regency. The town heroically resisted assaults led by Generals Álvarez and Van Halen; the governmental troops could not seize Granada and the revolt spread to several other towns, resulting in the fall of the Regency. Article 1. The town of Granada shall add to its old titles the title of "heroic". Article 2. To its crowned coat of arms shall be added the symbol of the Watch Tower flying the banner of Castile. The erroneous representation of the flag on the tower can be traced to two paintings offered by Isabel II to Granada, one featuring the gilded arms, without any other colour, and the other one on the charter offered on 1 December 1843, often considered as the "grant parchment", which it was not. The two paintings were elaborated in a jewellery located Calle Mayor in Madrid and showed to the public. The charter is decorated with a miniature representing the arms, with the national flag substituted to the Royal banner of Castile. The artist must have been influenced by the recent Decree, adopted on 13 October 1843, which converted the Spanish naval ensign to a true national flag, to be used by all military units and ministries. The error remained unnoticed and the genuine arms were kept in use until the miniature was revamped. The substitution occurred, in spite of the blazon given by Vicente de Cadenas y Vicent, King Chronicler of arms, "Azure on rocks argent a fortified wall surmounted by a tower or unsigned by a flag gules".